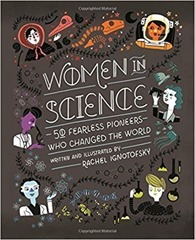 Women in Science by Rachel Ignotofsky is a whistle-stop tour of 50 women in science mainly from the mid-19th century onwards. Each woman gets a double page spread, with a few paragraphs of text on one page and a cartoon drawing of them and some catchphrases on the other. As well as this there is a centrefold of lab equipment, a timeline and some very brief descriptions of 14 further women in science at the end. You can see more on the authors website, here. Also included are some statistics on women in science, technology, engineering and maths (STEM), I suspect the figures relate to the US but the picture would not be dramatically different in the UK. On the plus side the proportion of women in STEM has increased from 14% in 1970 to 41% in 2011 and it has been rising steadily. The proportion of engineers who are women rose from 3% in 1970 but has been on a plateau at 13% since 1990. In computer work the proportion of women peaked in 1990 and has been dropping since then, it now stands at 27%. Why is this important? Historically women have been treated as second class citizens. It wasn’t that they tried to do the things that men did traditionally, and failed. They were very actively prevented from studying in their chosen fields. They weren’t allowed into science labs or science lectures. And if by some chance they did manage to train themselves, there were no jobs or facilities for them to continue their work because they were women. This is the legacy we are trying to overcome. It isn’t a matter of deep history, women alive today will have been refused access to degree courses in their chosen subjects. Cambridge University, for example, only awarded the first full degree to a woman in 1946, which is the year my mother was born. The parents of men alive today would have kept those systems in place. Women only got the vote in the UK during the lifetime of my grandparents. After I was born my mother was denied an application form for an administrative job at a local garage because the owner felt that her place was at home with her young children. Since the 1970s the spirit of the welfare system in the UK has changed to one in which it is seen as best for both parents to work. And yet historically women have been denied access to many careers. This leaves a legacy because people tend to recruit other people like themselves. The aspirations of children and young people are shaped by the roles they see people like them undertaking. This book provides a set of role models that show that women can be successful in science. The 50 chosen women are from a range of sources, many of them are from the rather sparse roll-call of female Nobel Prize winners. Some of the names I recognised: Marie Curie, Jocelyn Bell-Burnell, Jane Goodall, Ada Lovelace, Katherine Johnson (through my very recent reading), Dorothy Hodgkin, Rachel Carson, Lise Meitner. Others I had never heard of, like Lillian Gilbreth who worked on psychology and industrial design. Or Patricia Bath, who founded the American Institute for the Prevention of Blindness. I’ve looked through the book with my son (aged 5), he seemed to like it – although his main questions on each page were “Where was she born?” and “Where did she go?”. Then again in a book on the history of art his questions were “Where’s Jesus?” and “Why are those people naked?”. I suspect it is better suited to children a little older than him. Currently my son is binge watching “Horrible Histories”, a programme for children about history. It is a string of vignettes from history acted as adverts, as music videos, game shows or just plain acted. It is lively and educational. It strikes me that Women in Science would provide an excellent source for a sister programme. I don’t think I am the intended audience for this book but it did remind me to put some more biographies of women in science on my reading list. I’m pleased to see there is a biography of Maria Sibylla Merian, 17th century illustrator and entomologist. Ada Lovelace and Mary Anning are also on my list.